Are you suffering from stress, insomnia, anxiety or intense food cravings? If so then Relora may be an answer to your problems. Relora is a set of 2 distinct herbal remedies that have proven efficacy in treating multiple conditions. 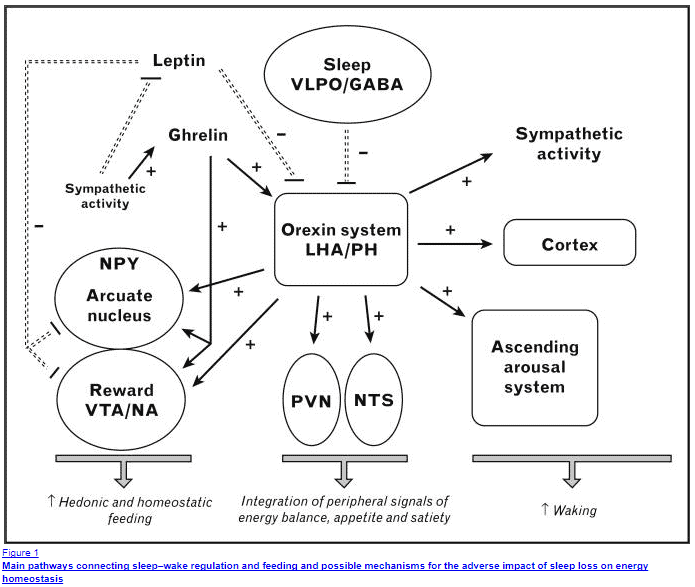 These effects extend beyond targeting stress and may help with weight loss as well. Relora is a powerful combination of Chinese herbs that includes both Phellodendron emurense (1) and magnolia officinalis (2). For centuries these herbs have been effectively used to help manage stress, reduce anxiety and ​help improve sleep. These documented benefits result from the direct interaction that these herbs have on hormone systems in the body and on anti-inflammatory pathways. One of the most interesting of these benefits is how Relora interacts with the stress response and how it can help with weight loss. This is probably the most well known and intended benefit of using Relora. Nowadays most people suffer from an excess of stress which leads to a well-documented decline in overall health. The hormone cortisol is secreted from your adrenal glands when your body is under any sort of stress. Have you been stuck in traffic recently? Have you had a fight with a spouse or loved one? Have you had a few nights of restless sleep? Normally this response is actually a good thing. Your body recognizes the stressful situation and releases cortisol to help increase energy expenditure, release glucose stores and help you get through the stressor. The problem comes when this system fails to shut down or is activated constantly. So how does Relora fit in? 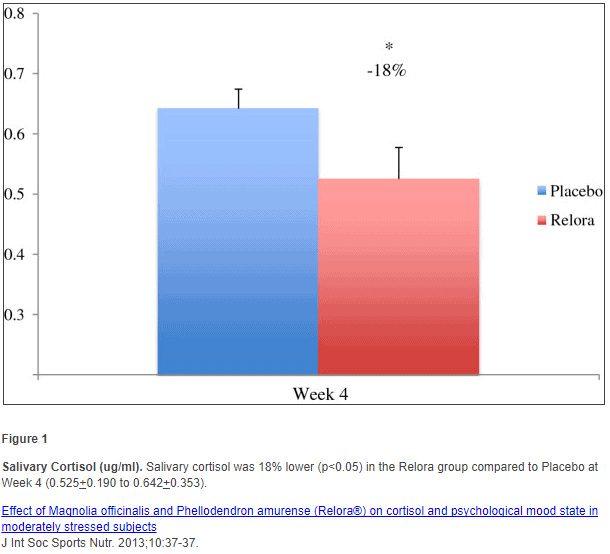 Patients who took Relora daily for 4 weeks were shown to have approximately 18% less cortisol than placebo when salivary cortisol was tested. 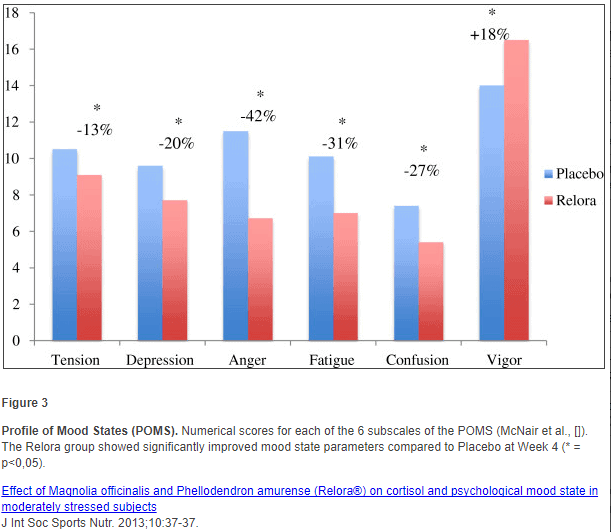 In addition, patients who took Relora were also reported to have less fatigue, less confusion, less depression, less overall stress when compared to placebo (3). Perhaps, more importantly, is that these people also reported an improvement in their overall mood and an 18% increase in "vigor". Anti-depressants are commonly used to treat both Anxiety and Depression in the U.S. It's estimated that more than 10% of the entire American population is taking one or more antidepressant drugs. Put into simple figures this is around 27 million people! The truth is that many people suffering from depression may actually be suffering from overexertion related to high demands and high-stress environments. The treatment should always be to change the environment, but sometimes that just isn't possible. You may not be able to quit your job, but you can take an antidepressant to try and cope with it. Magnolia bark (which is an active component of Relora) has been used for centuries in Chinese medicine to treat the condition of "stagnation of Qi". ​The symptoms associated with this condition mimic closely the westernized definition of "burn out". Burn out is﻿ known to trigger ﻿psychiatric (4) conditions such as anxiety and depression in many people. This anxiety stems from the inability to "shut down" or "slow down" your racing thoughts due to over-activity of the sympathetic nervous system. This may lead to heart palpitations, insomnia, hot flashes/warm flushes, panic attacks and generalized anxiety. While these symptoms are likely caused by multiple factors, one such factor is sensitivity to cortisol receptors in the body. Each person is unique in how they react to certain levels of cortisol, but those who tend to suffer from anxiety from elevated stress (5) may find benefit using Relora to help "soothe" their symptoms. Another potential benefit of using Relora is that it may alter food cravings triggered by stress. We all know that some people suffer from food cravings more than others. Certain people tend to lose weight when under stress and others tend to turn to food. Cravings while under stress are known to lead to weight gain. Relora has been shown in small pilot studies to reduce the impact and degree of food cravings as a result of stress. The participants in this study did NOT gain weight compared to the controls who did gain an average of 6-8 pounds during the stressful event. The active ingredients of Relora, especially the Magnolia officinalis bark have been shown to have properties (6) that act in a similar way to benzodiazepines. Benzodiazepeines include prescription medications such as Xanax and ​Valium. ​It is suspected that this herb likely works by potentiating GABA pathways in the brain. The modulation of these pathways then results in a reduction in stress, nervous tension, irritability, concentration difficulties, and sleeplessness. It appears that this herb is acting both as a sedative and as a hypnotic (to help you sleep). In addition, it likely also plays a role in balancing your circadian rhythm (7) which is the internal clock in your body that helps regulate when you start to wind down each day. While I wouldn't suggest taking Relora if weight loss is your primary goal, it still does have several benefits that might increase weight loss if used as part of a comprehensive weight loss plan. We know that weight gain is multifactorial, meaning you gain weight from multiple causes. Obviously, there are many more factors not listed here, but it's worth pointing out that Relora may influence each of the known factors listed above. Through its effects on improving the quality and depth of your sleep, by reducing food cravings and by helping reduce stress and cortisol it is possible that Relora can be used as part of a weight loss plan. The real point here is that Relora should NOT be used by itself for weight loss as the studies in this area are lacking. You can compare this idea to supplements such as fish oil, berberine or alpha lipoic acid which have been shown in studies to help with weight loss. Should you jump into using Relora? Like other supplements, you should try to target your supplementation to make sure that it works best for your body. I recommend looking at the list of symptoms below for which Relora has been shown to have efficacy. Start with 1 capsule twice daily. Take 1 capsule in the morning and 1 capsule no later than 5pm at night. If using Relora for sleep you can use 1 capsule in the evening and 1 capsule in the morning (this will allow a higher concentration in your body throughout the day). The therapeutic dose for Relora ranges from 250mg to 500mg daily. *Note: Some patients experience an increase in energy when taking Relora so don't use it at night if this happens to you. Relora as a supplement is generally well tolerated. Because Relora may be influencing cortisol levels in your body there may be some mild side effects for some people (though not everyone is likely to experience any side effects). According to some sources over 80 million doses of Relora have been taking in the U.S. and there have been no major adverse side effects reported. This leaves Relora with a pretty good track record! Drowsiness --> I wouldn't necessarily list this as an adverse effect because most people take the supplement to help sleep at night. Even so, this side effect wears off after a few days of use. Small drop in blood pressure --> One study showed that people taking Relora experienced a small drop in blood pressure, about 5mmhg systolic. So for a regular blood pressure of 120/80, your blood pressure might fall to 115/80 while using Relora. Because most people suffer from high blood pressure this might actually be another benefit unless you have very low blood pressure at baseline. It's worth noting that other studies did NOT show that Relora reduced blood pressure (11) to a noticeable degree. Gastrointestinal issues --> Some people have reported diarrhea at extremely high doses. ​Because Relora may share similar pathways as certain medications such as Benzodiazepines it is not a good idea to take both Relora and those types of medications. Lastly, it's worth pointing out that while Relora has many benefits on its own, it can also be combined with other supplements for added benefit. This is particularly true if it is added to supplements such as adrenal adaptogens such as Ashwagandha. Because adrenal adaptogens have also been shown to normalize cortisol levels through a different mechanism than Relora. This presents an opportunity for synergistic effects between the two supplements. I have also found that using Relora in combination with other herbs improve the effects of reducing food cravings, releasing anxiety and increasing energy. ​You can find more about using Relora in combination with other supplements here. Relora is a powerful supplement that may help you tolerate stress, improve the depth and quality of your sleep, reduce anxiety, banish food cravings and potentially help with weight loss. ​To get these benefits you will need to use 250 to 500mg of Relora each day for up to 4 weeks. Have you used Relora before? Did it work for you? Why or why not?